John CRAIG b. 1864, Raphoe, Co Donegal, Ireland, son of Samuel CRAIG & Martha Sarah KELSO was married in 1895 in Victoria to Frances PEARCE b. 1859, South Australia, daughter of William PEARCE and Ann WATTS. 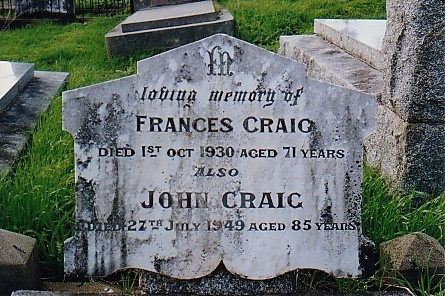 John CRAIG and his wife Frances PEARCE are buried in the Coleraine Cemetery. John CRAIG had a brother Samuel, sister Elizabeth and maybe another sister Martha. This John CRAIG can easily be confused with another John CRAIG, born Coleraine, Vic in 1863, son of Henry Alexander CRAIG and Margaret CURRIE. "...The late Mr David Lindsay, whose death was noted in Monday's issue, was a native of Raphoe, County Donegal, Ireland. He arrived in Victoria in the year 1891 in the Company of Messrs. John Craig, John Kilpatrick, William Laird and James Russell. On the voyage to Australia on the ship Oratava, Mr Lindsay was looked upon as the captain of the Raphoe five...."
Adrian Johnston, Co Donegal, Ireland who is looking for other emigrants from Raphoe, Co Donegal, Ireland. "I am doing research on various families that lived in an area north of the town of Raphoe. I live in this area and it is just a personal interest that I have."